The state of Washington offers a wide variety of opportunities for hang glider and paraglider pilots of all skill levels, from gentle consistent ridge soaring to world-class cross-country flying. Geographically, the state is divided into two major regions by the Cascade mountains. To the west of the mountains (often called “Western Washington”) the climate is dominated by marine influences from the Pacific Ocean and Puget Sound. As a result, the weather is mild and wet, giving rise to gentle thermals, relatively low cloudbase and large forested areas. Washington’s major population center, the Seattle-Tacoma-Everett area, lies between the east side of Puget Sound and the western slopes of the Cascades. There are a large number of mountain sites in the Puget Sound region, mostly in the Cascade foothills. 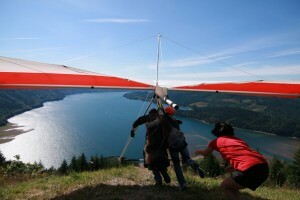 The most popular Seattle-area site is Tiger Mountain, which has been the starting point for many XC hang glider flights in the 10-100 mile range. To the south, Dog Mountain in Morton provides consistent ridge soaring with occasional good thermal days. Towards the Canadian boarder, Blanchard Hill near Bellingham provides excellent but inconsistent year-round ridge and thermal soaring, and Black Mountain near Glacier is a good thermal site when the launch is snow-free (roughly June-October). To the east of the Cascades, the weather is much drier and the terrain is mostly flat from the Columbia River to the foothills of the Rockies in western Idaho. 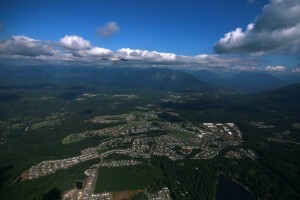 Chelan Butte, located at the easternmost edge of the Cascades, is ideally situated to take advantage of these conditions for long cross-country flights. It has been the site of two previous US National Hang Gliding Championships and a two Women’s World Championships, and hosted the US Nationals of both hang gliding and paragliding in July, 1995. Flights of over 100 miles are not uncommon from the Butte in the summer. There are a number of other sites in Eastern Washington, both along the eastern edge of the Cascades, and in the Spokane area. Also, towing is common in the flat areas between the Columbia River and the Rockies. If you plan on visiting Washington, be sure to bring your glider, and to contact local pilots to check on protocols before flying any of our sites. We welcome visiting pilots, and encourage them to take advantage of the spectacular flying in our state.